1) The word Allah is a defective noun because it has no dual nor plural form; secondly, it isn’t derivative because if it had beenso, then it should have had a root from which it had been derived andconsequently the word Allah would have been recent. In fact theword Allah is ancient and eternal as the Exalted Self, thereforeit must be a defective noun. 2) The word Allah is a proper noun designated to the Exalted Self that is described by all the divine attributes; this all-inclusive name comprises all the Exalted Self’s attributes, so we say, the Most Gracious, the Most Merciful Allah. Apart from the name Allah, each of the names of the Exalted Self concerns a special singular meaning and is a description of it. Since the Exalted Self must have a name that comprises all the Divine attributes and since this name cannot be designated to anyone save the Exalted Self, therefore this name must be exclusive to the Exalted Self. Moreover this is not an epithet because if it were so, then theprofession of faith (There is no god but Allah) would not denotethe Profession of Monotheism, just as the phrase (There is no god butthe Most Merciful), does not denote Monotheism. 3) The most acceptable viewpoint is that the word Allah is a derivative noun, it had been an attribute at the very start but it became the proper noun that pertains exclusively to the Exalted Self and thereupon, we dispense with any other name to define Him and any other name is added to the name Allah, so we say, the Patient, the Omniscient, andthe Subduer are some of the names of Allah, but we cannot say,Allah is one of the names of the Most Merciful, or of the Omniscient. b) Aliha: to have faith in and to be calm in the presence of someone, because hearts find satisfaction in the remembrance of the Exalted Self, and souls pacify in knowing Him. c) Alaha: to become confused and baffled as minds are bewildered in knowing and comprehending His attributes. d) Alihahu: to be to succoured, as the afflicted person resorts to Him and He protects him. e) Aliha: to be emotionally attached to the mother at the time of weaning, since worshippers are emotionally attached to the Exalted Self, and supplicate to him in times of affliction. f) Laha: to be veiled and high in rank, because the Exalted Self is veiled from perception and vision, and is high above everything. 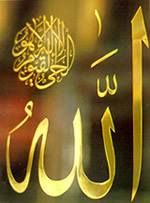 The name Allah is the greatest of the names of the Exalted Self and the most comprehensive. Furthermore, it is said that it is the most eminent name by which if the human being calls upon the Exalted Self, the call is answered, that is why no one else has been called by that name and this is confirmed in the Quranic verse, “Knowest thou of anywho is worthy of the same Name as He?” (MARYAM, 65). One of the interpretations of this verse states: Is there anyone who bears a name similar to His name? Allah is the name of the OnlyTruth, Whose existence is the only true existence, the One Who combines all divine attributes, Who is qualified with all the divine epithets. Only to Allah is attributed the real existence, because every existing being is not self-existent but gains its existence from the Existence of Allah, Praise and Glory be to Him, He is Allah.